I am so excited to bring you guys this Vegan Crème Egg Cupcake Recipe! 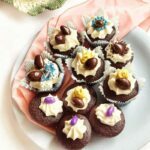 This super easy and festive vegan filled cupcake is an extra special way to celebrate Easter this year! Sometimes it can be hard to figure out what substitutions you can make when you first go vegan. Even for veterans like myself it can be a challenge coming up with cruelty free ways to celebrate the holidays. 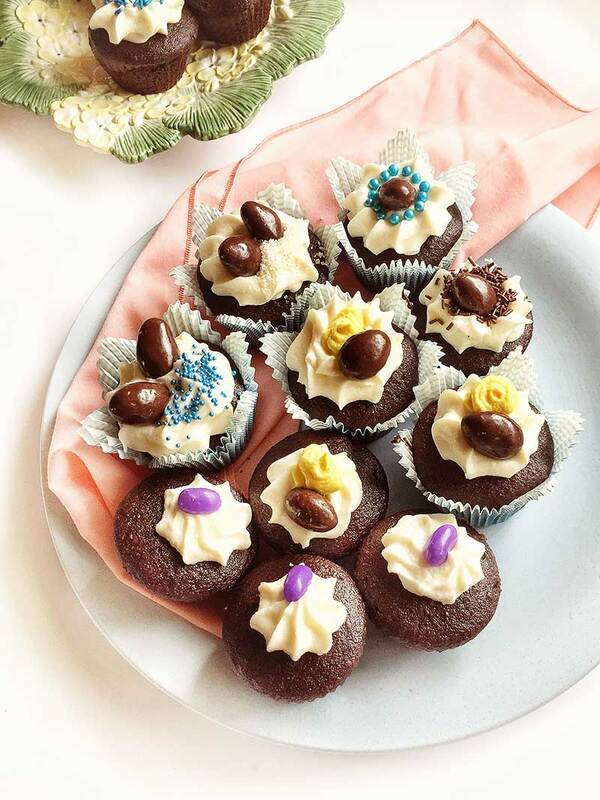 These vegan chocolate cupcakes are the perfect way to celebrate Easter!! 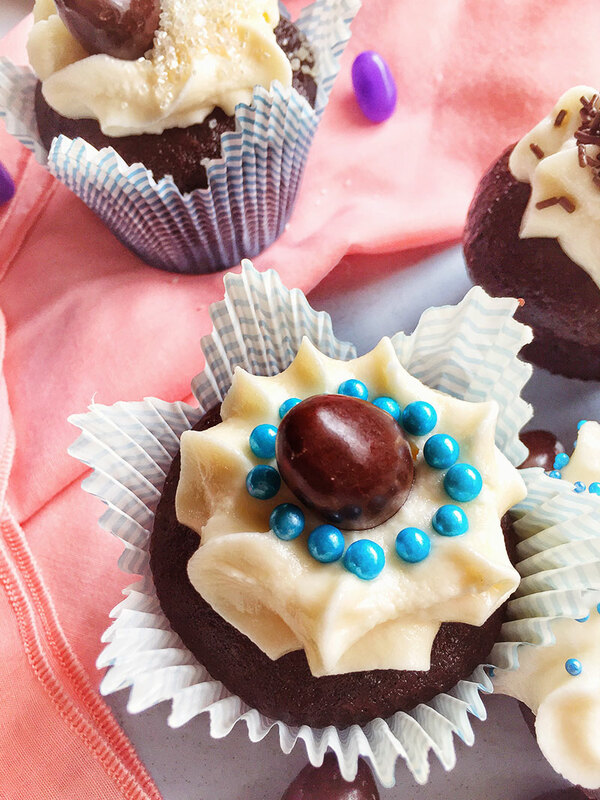 Moist chocolate cupcakes are filled with a vegan crème egg buttercream frosting! What are Vegan Cupcakes Made of? Don’t worry-these vegan cupcakes still turn out incredibly moist and rich-you won’t notice a different taste at all. These are 100% omnivore approved! For this recipe I’ve chosen to use Silk Soy Original soy milk for the dairy. I find this soy milk to be very rich and thick-perfect for the kind of texture we are looking for. If you are avoiding soy, or you cannot find this where you are, please feel free to substitute with any other plant milk you prefer! Apple sauce, baking soda and baking powder will help keep the cake together and give it a little lift-no eggs required! Surprisingly quite a few store bought frostings are accidentally vegan! Most Betty Crocker frostings do not contain any milk ingredients. When you check the back of the package it will say “may contain milk ingredients”. What this means is that these frostings are produced in the same factory as another product which contains milk. If you are really running short on time or need the convenience you can absolutely substitute a commercial frosting for a homemade one in this recipe, and still make it vegan! How do you Make Buttercream Frosting Vegan? Buttercream frosting is way easier than most might think to veganize. All you need to do is substitute a vegan butter for the traditional butter. For this recipe I chose Becel brand vegan margarine. I’ve used Earth Balance brand as well and I really like this one too because it hardens nicely in the fridge once the icing is made. To make our filling look just like a vegan crème egg, I’ve used turmeric to color it! Turmeric is an excellent way to make all foods yellow/orange in colour. Don’t worry, it will not affect the taste of this frosting! If you prefer you can use any other yellow colouring you already have on hand. …Hum, of course!!! And what would life be like without filled chocolate cupcakes? Not very fun my friends! 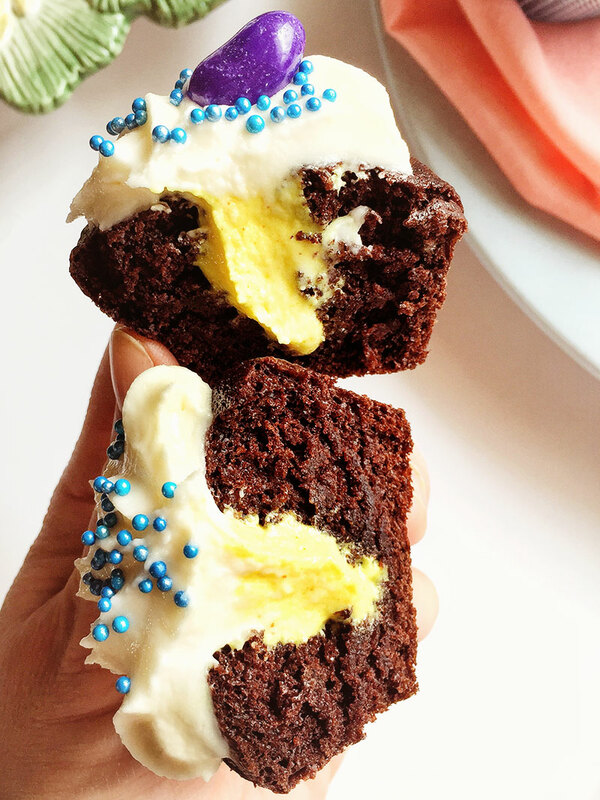 With the few substitutions I mentioned above, you will be enjoying these Easter cupcakes in one form or another all year long! The base of my vegan Easter cupcakes is inspired from a recipe over on Nora Cook’s blog. I’ve used her recipe, or a variation of it many times now-always with great results! It really is the BEST vegan cupcake recipe I’ve found. And why mess with perfection? I have modified just a few things for these cupcakes here. Instead of adding boiled water to the batter at the end, I’ve decided to swap out hot coffee. The coffee really deepens the flavor of the cupcake, and it compliments the bitterness of the cocoa beautifully. This also balances the sweetness from the sugar of the vegan buttercream frosting, which is important since we will be filling our cupcakes as well as topping them with this sweet treat! 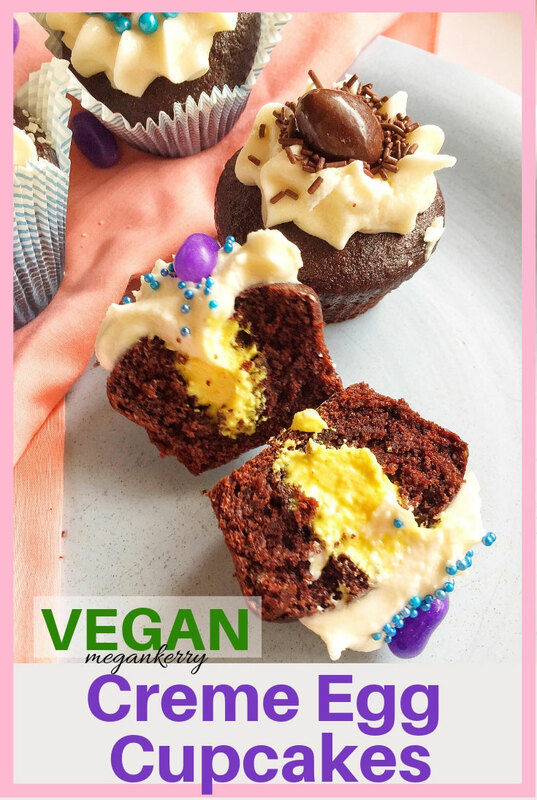 So, now that you have an idea of what we will be using to make our vegan Easter cupcakes, let me show you how to put it all together! 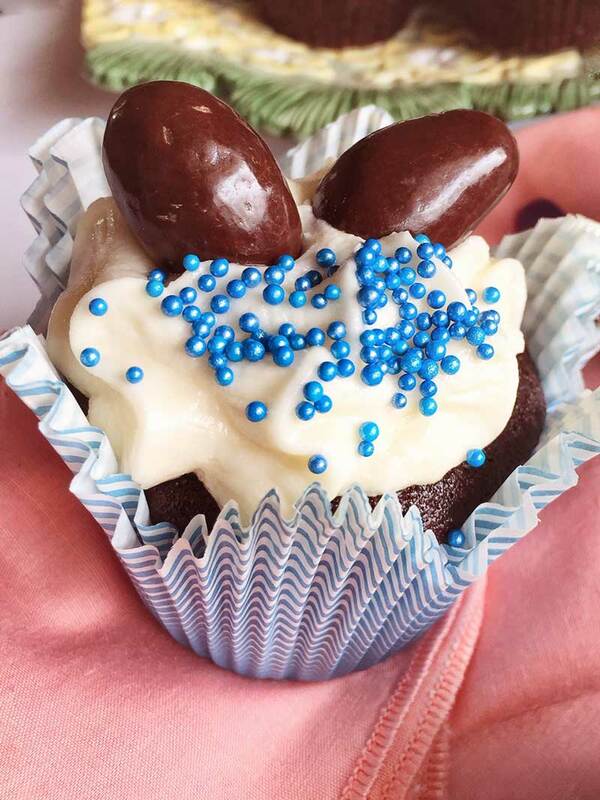 Author: Megan Kerry These vegan Easter cupcakes are filled with a delicious buttercream frosting. They are the perfect way to celebrate the Easter holiday! Preheat the oven to 350 degrees Fahrenheit (175°C). In a large bowl, add the soy milk and apple cider vinegar. Stir to combine. This will begin to curdle. To the milk mixture add in the rest of the wet ingredients EXCEPT the HOT COFFEE. We will add this at the end. Stir to combine. Sprinkle your flour, sugar, cocoa powder, baking powder, baking soda, and salt over the wet ingredients. Using a hand mixer or whisk, stir until all the ingredients are incorporated. Pour in the hot coffee and stir to combine. Once cupcakes are done cooking, remove from the pan to a cooling rack. Allow to FULLY COOL before filling and decorating, about 1 hour. In a large bowl add the butter, icing sugar, salt and vanilla. With a hand mixer or spatula mix everything together until combined. Remove half of the mixture to another bowl and sprinkle in the turmeric or other food coloring. Mix to combine. 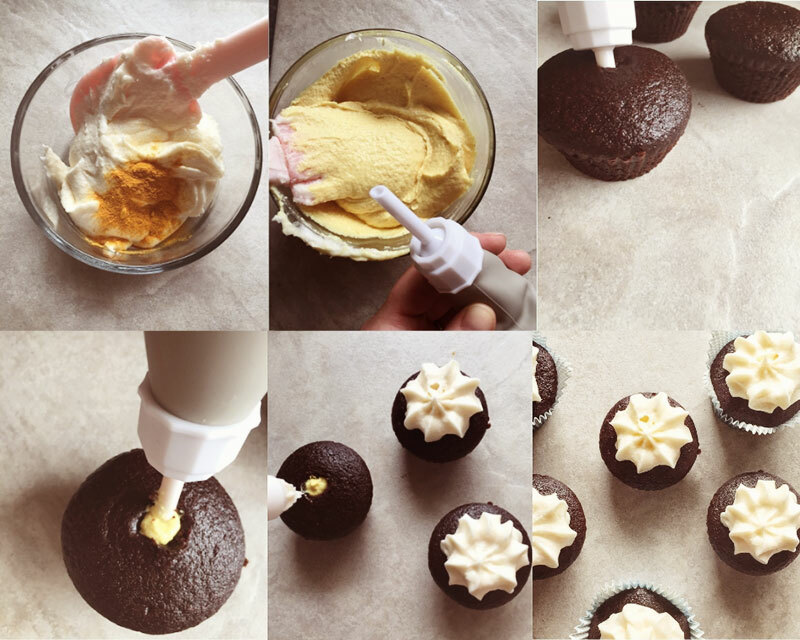 Add the yellow frosting to a piping bag with a long, skinny tip. Make a small hole in each cupcake using a chopstick or a clean finger. Fill each cupcake with the yellow frosting. Place the white frosting in a new (or cleaned) piping bag with your tip of choice. Pipe the remaining frosting over the cupcakes. Decorate with sprinkles, dark chocolate covered almonds, jelly beans or your vegan candy of choice! Do Vegan Cupcakes Need to be Refrigerated? These filled cupcakes will stand up well for up to 2 days on the counter, and a week in the fridge. Can you Freeze Vegan Cupcakes? Yes, you can freeze the cake portion only of this recipe. So, if you would like to make the cake ahead you can bake them up, allow to cool and then individually wrap them and place them into a large freezer bag. Pull them out and set them on the counter at least 4 hours before decorating! Do not attempt to freeze these once you have already frosted them! I really hope you guys enjoyed my Vegan Crème Egg Recipe! I know my kids absolutely loved decorating them! And it was a special surprise when they bit in and saw the yellow “yolk”! Because these vegan cupcakes do not contain dairy or eggs they are extra great to bring to school the share with all your kiddos teachers and friends! I want to thank Francesca for having me over on the Seven Roses blog! If you are here from one of my social media platforms, please consider subscribing to her blog and socials!! She has a ton of vegan and cruelty free lifestyle tips here that you will definitely enjoy!! And if this is the first time you’ve met me-nice to meet you!! I’m Megan and my content focuses on veganism as a family and how we make it work for us! My food blog, https://megankerry.com has a ton of vegan comfort food options that are 100% omnivore (and picky kid) approved! You can find me over on Pinterest for even more recipe and food inspiration! I pin new vegan recipes daily from around the world! Follow along on Instagram @megan_kerry_xo for a sneak peek at recipe development, food photography and an inside look into the life of a vegan family. My YouTube channel is where the most fun is at though😉. Head over to Megan Kerry on YouTube to see grocery hauls, thrift store hauls, recipe videos, and family and lifestyle content all centered around veganism and sustainable living! I’ve created a Pin for your board, so you can easily come back to this recipe when you’re ready to try it out!! If you are excited about this recipe, don’t forget to RATE THIS POST! 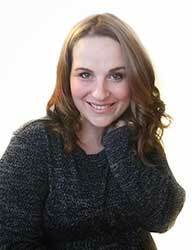 Megan is a Vegan Lifestyle Educator who specializes in veganism as a family. She is a mom to three (soon to be 4!) amazing little’s and a proud wife and work at home mama. She is a long-time vegan and an even longer time foodie! She loves veganizing any and all dishes and sharing her recipes with all of you! You can find her recipes on her food blog, megankerry.com and even more lifestyle resources and tips on her YouTube channel at Megan Kerry. 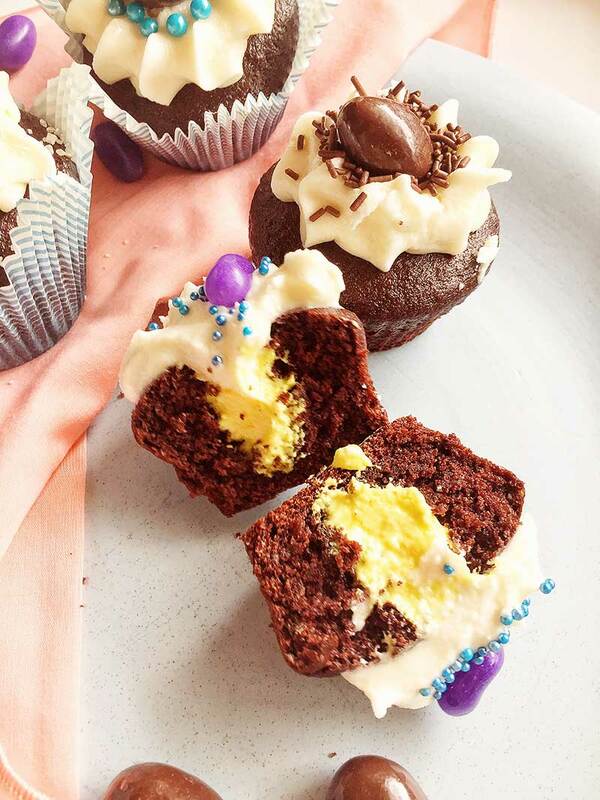 A big thank you to the lovely Megan for this amazing recipe that she shared with us just in time for Easter! I for sure will be making these awesome Vegan Crème Egg Cupcakes. What about you? Hey Megan, well done! Just what I was looking for to host an Easter Monday informal gathering. Could I use this recipe to make mini cupcakes?! If so, how long should they be in the oven?